healthy lesson horses. 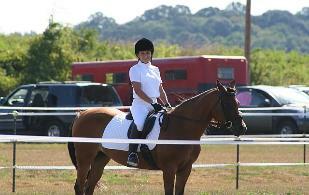 Allow me to tell you a little more about myself and my equestrian experience. 3rd overall in Advanced Hunt Seat Equitation on the Flat. compete due to illness (despite my protests!). current facility in Leonardtown and named it Serenity Cove Stables. Finals in the Arabian PureBred Hunter Over Fences division in 2008. Columbia. I am currently developing my farm into a private lesson facility. Upper Marlboro, MD. Champions and Reserve Champions in Green/Open Hunter and Equitation. 1989-1991- Barn manager for El Naja Arabians, a breeding and boarding facility in LaPlata, MD. Greenwell State Park's riding program. Division MAHA judged ride. All in this horse's first year of showing ). 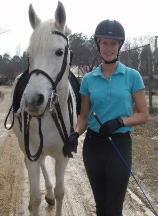 teach one day a week at Serenity Cove stables, owned by certified instructor/trainer Erica Gowen. equestrian theater, which travels throughout MD and VA. Member of NARHA, CHA, USDF, PVDA and MAHA. to achieve clear, correct, and compassionate communication every time we ride.